When scanning through books to read, I came upon this gem. 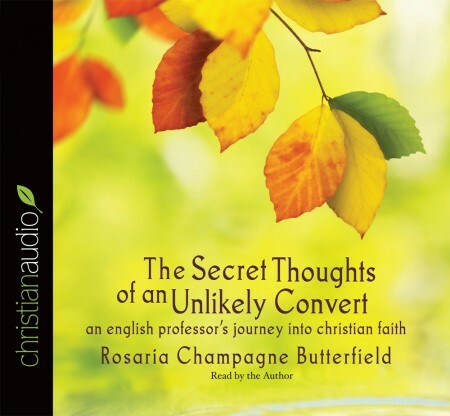 I had never heard of Rosaria Champagne Butterfield, but the title was very intriguing. I placed it on my "to read" wish list. Then I was blessed to see it offered for audiobook review. Needless to say, I jumped at the chance. This book has to be one of the most heartfelt biographies I have read (or listened to) in a long time. Rosaria's story is not you average - "I did drugs and Jesus saved me" testimony. She was an English professor, a gay rights activist, and a practicing lesbian. She was writing a book against the christian right, when God stepped in. We normally see the person come to the Lord at the end of a book like this. But in this case, Rosaria is saved in the middle. We not only get a glimpses of her life without Christ, we also get to see what happens after she is saved. Boldly honest, this book pulls no punches! The narration is preformed by the author and it is well done. Because it is her story, we hear the emotion as she reads. I highly recommend this audiobook and give it 5 out of 5 stars. I enjoyed this book courtesy of the Christian Audio review program at http://christianaudio.com and received the audio book, free of charge, from ChristianAudio.com and Crown & Covenant Publications in exchange for an honest review.